I was also quite surprised by The Star’s endorsement as they usually are all about going with the flow and established power movers. In my opinion, Glynn and Canady are the only two independent thinkers in the race. I hope at least one makes it to the runoff. Phil Glynn has an outstanding, national reputation for AUTHENTIC economic and community development. He’s proven he’s got grit by standing up to well-heeled corporations seeking tax incentives in the prosperous Crossroads District. Glynn will represent the interests of all Kansas Citians fairly — not just the wealthy “developers.” Check out his campaign donations. He has more “small contributors” than any other candidate. He isn’t owned by the self-interest groups throwing about $660,000 (builders and unions) behind Justus and $550,000 behind Miller. I think it’s time we stop trying to back winners and make winners out of leaders. See my response to Vern Barnet’s comment…Ditto here. Thank you for carefully examining the mayoral field and presenting your observations. First, the two you have selected are fully worthy of your endorsement in my opinion. Watching Alissia Canady on the Council has been a refreshing surprise. She is forthright and has the City, not her bank account, in mind. 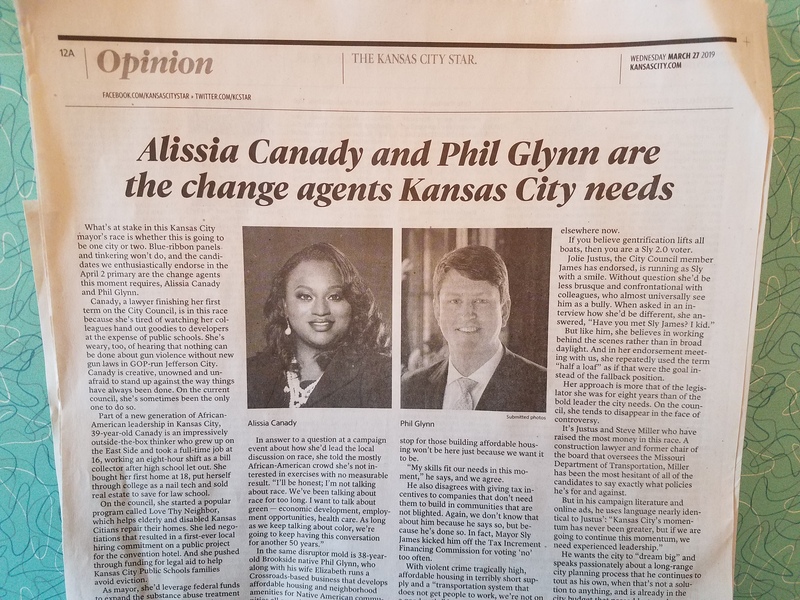 Phil Glynn is easily the best qualified outsider with values and experience the City needs to move forward. Second, thanks for seeing through the hoax that is Jolie Justus. She neglects our communities even as she hypocritically advertises a dedication to them. He back-room dealing is her way of building power without being responsible. Her support for the foolish, regressive sales tax is another example of being Sly’s baby, not the thoughtful leader we need. You were also right in my opinion to mention Quinton Lucas who had a lot to contribute in the future. I really liked the way he handled the DUI. I like the fact that he can change his mind given more information. I’m writing with such gratitude because I have thought only The Star might be able to save us from the disaster of the developers’ money — that is Jolie Justus. I want to make clear I am a strong LGBT supporter, and my many reasons to be concerned about her overcome my natural disposition to support her. I campaigned for her four years ago. That’s an excellent letter, Vern. I know you are a close follower of city politics and know what you’re talking about. If we’re lucky, this editorial will prompt a surge of interest in the mayor’s race. This is a question that I have never thought of before. Who at the newspaper makes the decision that “The Star endorses so-and-so?” Publisher? Editors? A group of writers? Is the decision process about the same at all newspapers? Yes, John, it is about the same at all papers. Customarily in big elections, like this one, most or all board members interview all the candidates separately. Then, the board gets together and talks about who they believe should be endorsed. Decisions could be arrived at by consensus or vote. In my experience, the publisher (not just Berg but those in the past) tends to defer to the majority, and the editorial page editor’s opinion is disproportionately influential. However, the publisher can supersede the majority, and once in a while that happens. I recall a case many years ago when then-Publisher Jim Hale ordered the endorsement of the late Bill Waris, I believe it was for re-election as Jackson County executive. Yael Abouhalkah, who wrote most of the political editorials, had to take up pen and write an endorsement editorial about a man he loathed. As I recall, Waris won. My favorite was when Barbara Shelly had to write the endorsement for a conservative JOCO Senator who had signed on to the latest establishment scam of raising money for a research institute (which was scandal ridden from day 1). Her column read something like “For a fat girl she doesn’t sweat much..” and you could sense her throwing up in her mouth as she wrote each word. Priceless. There was another time when a reporter went to the editorial board knowing they would endorse the liberal in the race (also a woman) and told them flat out that the woman was nuts. After much bloodletting, rending of garments and teeth gnashing they endorsed her conservative male opponent.